عبدالهی, مهدی. (1395). انسجام‌گروی تبیینی در توجیه معرفت در ترازوی نقد. ذهن, 17(68), 71-98. مهدی عبدالهی. "انسجام‌گروی تبیینی در توجیه معرفت در ترازوی نقد". ذهن, 17, 68, 1395, 71-98. عبدالهی, مهدی. (1395). 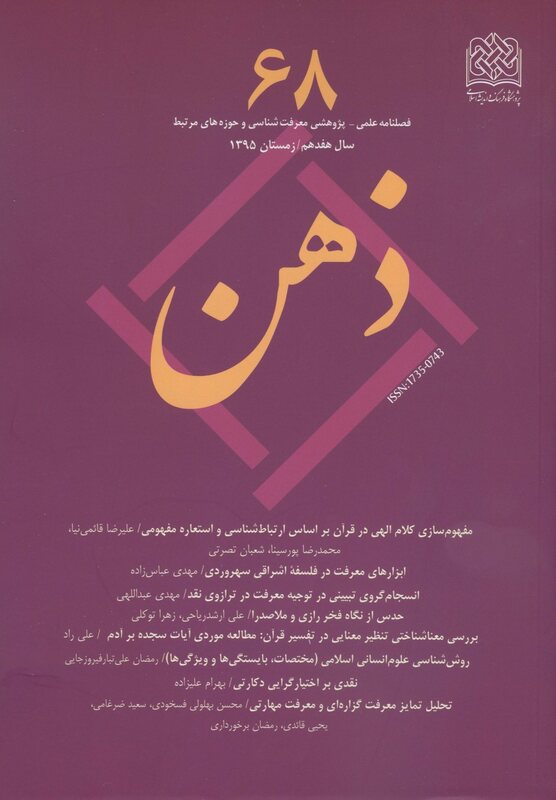 'انسجام‌گروی تبیینی در توجیه معرفت در ترازوی نقد', ذهن, 17(68), pp. 71-98. عبدالهی, مهدی. انسجام‌گروی تبیینی در توجیه معرفت در ترازوی نقد. ذهن, 1395; 17(68): 71-98. با اینکه «مبناگروی» رایج­ترین نظریه در توجیه معرفت است، انتقادهای ناظر به آن سبب شد معرفت‌شناسان معاصر آن را کنار گذاشته، دیدگاه­های جدیدی ابداع کردند که مهم­ترین آنها انسجام‌گروی است. در این میان بیشتر انسجام‌گرایان طرف‌دار «انسجام‌گروی تبیینی» هستند. تبیین، پاسخ به پرسش از علت یک پدیده است. فیلسوفان علم و معرفت‌شناسان هیچ اتفاق ‌نظری در حقیقت تبیین ندارند؛ برخی الگوی قیاسی را مطرح کرده‌اند؛ برخی دیگر تحلیلی معرفتی از آن به دست می‌دهند و برخی ادعای بداهت مفهومی تبیین را پیش کشیده‌اند. به باور پیروان انسجام‌گروی تبیینی، باور به گزاره p هنگامی موجه است که با مجموعه‌ای از باورهای فرد که نسبت به سایر مجموعه باورهای او بیشترین حد از انسجام تبیینی را دارد، هماهنگی داشته باشد و باور به p برخی از باورهای آن مجموعه را بهتر از نقیضش تبیین کند یا اینکه آن باورها، باور به p را بهتر از نقیضش تبیین کند. انسجام‌گروی تبیینی اشکالات متعددی دارد؛ از جمله لزوم انسجام تبیینی بیشتر در مجموعه مشتمل بر حقایق کمتر، وجود تبیین­های بهتر، اما بی‌اعتبار و لزوم انسجام تبیینی مساوی در مجموعه‌های ناسازگار. تلاش‌های طرفداران این نگرش در پاسخ به اشکالات ناکام بوده است. Achinstein, Peter; The Nature of Explanation; New York: Oxford University Press, 1983. Bonjour, Laurence; The Structure of Empirical Knowledge; London: Harvard University Press, 1985. Bromberger, Sylvain; “An Approach to Explanation”; On What We Know We Don't Know Explanation, Theory, Linguistics, and How Questions Shape Them, Sylvain Bromberger, Chicago: The University of Chicago Press, 1992a. _____; “Why-Questions”; On What We Know We Don't Know Explanation, Theory, Linguistics, and How Questions Shape Them, Sylvain Bromberger, Chicago: The University of Chicago Press , 1992b. DeVries, Willem A.; Wilfrid Sellars (Philosophy Now); Chesham: Acumen Publishing Limited, 2005. Eberle, Rolf & Others; “Hempel and Oppenheim on Explanation”; Philosophy of Science, Vol.28, No.4, Oct., 1961, pp.418-428. Kitcher, Philip; “Explanation”; Routledge Encyclopedia of Philosophy, Edward Craig (ed. ); London: Routledge, Vol.3, 1998, p.520-525. Lehrer, Keith; The Theory of Knowledg; Colorado; Westview Press Inc, 1990. Moser, Paul K. and others; The Theory of Knowledge: A Thematic Introduction; New York: Oxford University Press, 1998. Pitt, Joseph C.; “Introduction: Through The Looking Glass”; The Philosophy Of Wilfrid Sellars: Queries And Extensions, Joseph C. Pitt (ed. ); Dordrecht: Reidel Publishing Company, 1978, pp.11-17. _____; Theories of Explanation; New York: Oxford University Press ,1988. Popper, Karl; Objective Knowledge: An Evolutionary Approach; New York: Oxford University Press Inc, 1979. _____; The Logic of Scientific Discovery; New York: Routledge ,2002. _____; The Poverty of Historicism; Boston: The Beacon Press, 1957. _____; “Is there an "I" in epistemology; Dialectica, Vol.66, Issue 4, 2012b, pp.517–541. Quine, W. V. & J. S. Ullian; The Web of Belief; New York: McGraw-Hill, Inc., 2nd ed., 1978. Quine, Willard Van Orman; Word and Object, Cambridge (Ma. ): The MIT Press, 1960. _____;, The Ways of Paradox and Other Essays, New York, Random House, Inc, 1966. Russell, Bertrand; The Problems of Philosophy; Los Angeles: Indo-European Publishing, 2010. Salmon, Wesley C.; Four Decades of Scientific Explanation; Pittesburg, Pittesburg University Press, 2006. _____; “Explanation”; A Companion to Epistemology, Jonathan Dancy and Others (eds. ); 2nd ed., Oxford, Wiley-Blackwell Publishers, 2010, pp.361-364. Vahid, Hamid; “Varieties of Epistemic Conservatism” Synthese, Vol.141, No.1, Jul. , 2004, pp.97-122. Chisholm, Roderick M.; Perceiving: A Philosophical Study; Ithaca: Cornell University Press, 1968. Clayton, Philip; Explanation from Physics to Theology: An Essay in Rationality and Religion; New Haven & London: Yale University Press, 1989. Dancy, Jonathan, and others (eds. ), A Companion to Epistemology, 2nd ed., Oxford: Wiley-Blackwell Publishers, 2010. Goldman, Alan H.; “Empirical Knowledge”; Berkeley: University of California Press, 1991. Harman, Gilbert, Change in View: Principles of Reasoning; Cambridge: MIT Press, 1986. _____; Thought; Princeton; Princeton University Press, 1973. _____; 2002, Reasoning, Meaning and Mind, Oxford: Clarendon Press. Hempel, Carl G. & Paul Oppenheim; “Studies in the Logic of Explanation”; Philosophy of Science, Vol.15, No.2, Apr., 1948, pp.135-175. Hempel, Carl G.; Aspects of Scientific Explanation and other Essays in the Philosophy of Science; New York: The Free Press, 1965. Hesse, Mary; “Simplicity”; The Encyclopedia of Philosophy, Paul Edwards (ed. ); New York: Macmillan Publishin Co., Vol.7, 1967, pp.445-448. _____; Knowledge; Oxford: Clarendon Press, 1974. _____; “Justification, Explanation, and Induction”; Induction, Acceptance and Rational Belief, Marshall Swain (ed. ); Dordrecht: D. Reidel Publishing Company, 1970, pp.100-133. Lucas, John R. The Freedom of the Will; Oxford: Oxford University Press, 2001. Lycan, William G.; “Explanation and Epistemology”; The Oxford Handbook of Epistemology, Paul K. Moser (ed. ); Oxford: Oxford University Press, 2002, pp.408-433. Moser, Paul; “Justification, Explanation, and Induction”; Induction, Acceptance and Rational Belief, Marshall Swain (ed. ); Dordrecht: D. Reidel Publishing Company, 1970, pp.100-133. Poston, Ted; “Introduction: Epistemic Coherentism”; The Southern Journal of Philosophy, Vol.50, Issue 1, 2012a, pp.1-4. Sellars, Wilfrid; “Particulars”; Science, Perception, and Reality, Atascadero, Ridgeview Publishing Company, 1991a, pp.282-297. _____; “Some Reflections on Language Games”; Science, Perception, and Reality, Atascadero: Ridgeview Publishing Company, 1991b, pp.321-358. Sober, Elliott; “Simplicity”; A Companion to Epistemology, Jonathan Dancy and Others (eds. ); 2nd ed., Oxford: Wiley-Blackwell Publishers, 2010, pp.738-739. _____; Simplicity; Oxford: Clarendon Press, 1975. Tagard, Paul; “Explanatory Coherence”; Behavioral and Brain Sciences, No.12, 1989, pp.435-502.